Poke a small hole into the center of the large bottom part of an egg with a sewing needle. Insert the needle a few times to enlarge the hole to about half the diameter of a pencil eraser. Heat an oven to 200 degrees Fahrenheit and place the egg, lying on a cookie sheet, in the oven for 15 minutes. 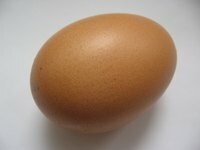 This will dry out the inside of the egg completely, and help harden it slightly. Remove the shell and let it cool for about 10 minutes before touching it.